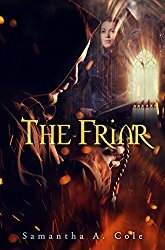 The Friar, a novel by Samantha A. Cole, is a contemporary story of suspense, romance, and, at its essence, the redemptive power of love. The male protagonist, Adam Westfield, had spent most of his adult life as a celibate member of the Franciscan Brotherhood, and the last five years in prison for a sinful crime that forces him, upon release, to seek a new meaning and self-forgiveness on the road. The female protagonist, Sage Hammond, has inherited from her dead husband a ranch with a long family history and a short supply of cash, leaving her with a mighty struggle to feed her children and her horses, let alone any employees. The arrival of a wandering man with a wounded soul and a healthy physique (not to mention a loveless past of religious celibacy, recently disavowed) couldn’t be more fortuitous, until trouble—and danger—begins. And so, The Friar whips up a perfect storm of emotional and personal conflicts, painful secrets that beget violence, all told against an authentic setting. Moral and ethical dilemmas heat up in an organic, genuine storytelling style, and the novel succeeds in painting three-dimensional, imperfect heroes that readers will easily relate to. In summary, The Friar is an excellent novel, mixing romance and suspense in a highly believable setting. The story moves along at a fast pace with high suspense, the characters are authentic and interesting, and the facts unfold with clarity and plausibility. The author skillfully balances the underlying, simmering dangers of violence and deep emotions, and while the resolution to the mystery begins to surface, new dangers appear. This is a veritable page-turner that will keep readers at the edge of their seats until the unexpected, yet satisfying ending. Highly recommended!